The gloves worn by Muhammad Ali in his 1971 "Fight of the Century" with Joe Frazier sold at auction for $388,375. A pair of sweat-stained boxing gloves worn by Muhammad Ali during his "Fight of the Century" with Joe Frazier more than 40 years ago were sold at auction Thursday for nearly $400,000. Heritage Auctions did not name the winning bidder, who paid $388,375 for the Everlast gloves from the 1971 bout. 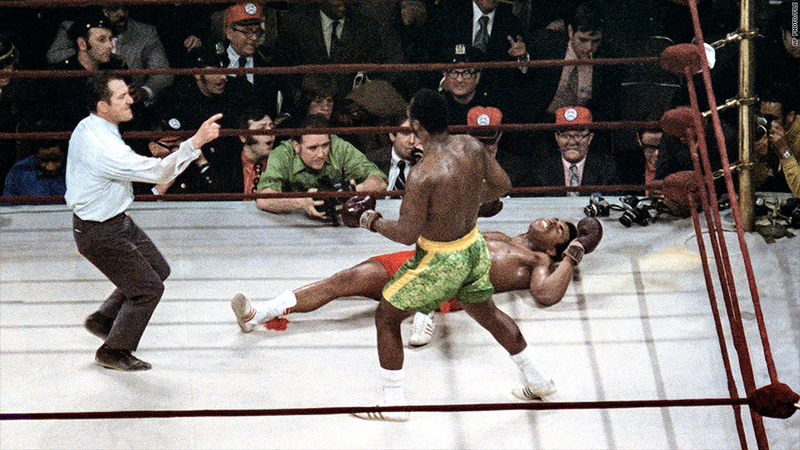 Ali lost that particular fight, which dragged on for 15 rounds at New York's Madison Square Garden. It was the first of three fights fought between the two boxers, according to Heritage Auctions. The hype around the fight was heavily politicized because of Ali's refusal to fight in the Vietnam War. "The Ali-Frazier gloves have been in my family's possession from the time I cut them off Ali's hands," he wrote. The gloves were auctioned at the House of Blues in Cleveland as part of Sports Collectibles Platinum Night. Other items included a Yankees cap and baseball bat used by Lou Gehrig in the 1930s, a home run baseball hit by Babe Ruth in 1934 and a Cincinnati Reds jersey worn by Pete Rose early in his career. Heritage Auctions said the boxing gloves are the most important to hit the auction block since February, when a pair worn by Ali in his victorious 1964 fight against Sonny Liston in 1964 brought in $836,500. Ali won his first World Championship from that fight.